In 2004, we entered the industry bringing with us new products, a fresh new approach to support, and more control for customers. We were the first provider to include a complete billing and CRM system free with our reseller hosting, and have created new and unique hosting packages that have brought success to our customers as well. We are passionate about bringing you the latest innovations and technology. We aim to always update our software, servers, platforms and systems to help you stay ahead of the competition. This means you’re always benefiting from faster, more secure hosting and the freedom to use the latest versions of programming languages and software without interruption to your services. Over the years, we have won numerous awards for our innovative, reliable and well-supported products, including the PC Pro award for Best Web Hosting in 2013, 2014 and 2015, MicroMart’s Editor’s Choice for Best Web Host in 2014 and the ISPAs Award for Best Shared Hosting in 2015. As long as the internet continues to evolve, so will we. We never stand still; we're always investing in our services and platforms to ensure we maintain our industry-leading reputation and are able to meet the ever changing needs of our customers as they grow with us. 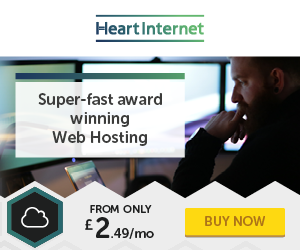 HeartInternet web hosting plans are perfect for websites of all sizes, so whether your website visitors are building their first website, looking for powerful and flexible web hosting without limits, or advanced ecommerce hosting.